Celebrating silver anniversary of TDI engine launch, Audi unveiled the all new Audi RS5 TDI Concept 2014. To make it reach till the benchmark a celebration model is supposed t be, company didn’t just concentrated upon the looks but also made sure that the equipment beneath the hood does its work properly enough to compliment its looks. Let us check review of Audi RS5 TDI Concept 2014 to learn more. 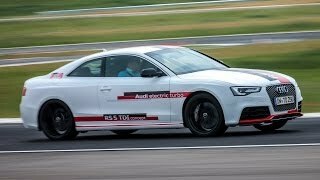 Audi RS5 in general resembles to the coupe powered by gasoline engine but company has added certain features to make Audi RS5 TDI Concept 2014 look distinct and special. The change mentioned includes the red and black stripes running through the hood, marching over the roof and touch the trunk at rear. Apart from this the lower part of bumper, side sills also inculcate these markings, in turn providing sporty attire to the entire Audi RS5 TDI Concept 2014 package. The impeccable amalgamation of white, red and black makes your Audi RS5 TDI Concept looks unmatched and elaborates the glory of celebration while you roll it down the lane. Audi RS5 TDI Concept 2014 produces total output of 385 hp and peak torque of 750 nm. 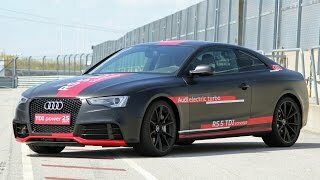 With this power rumbling the streets Audi RS5 TDI Concept 2014 takes just four seconds to reach 62mph from naught and can reach top speed of 174 mph.